GEMMA DI LUNA ELEVATES THE ORDINARY TO THE EXTRAORDINARY. Gemma di Luna presents the Italian Luxury Collection, a selection of wines meticulously crafted to elevate Italy’s most loved varieties from the ordinary to the extraordinary and turn everyday experiences into moments of luxury. 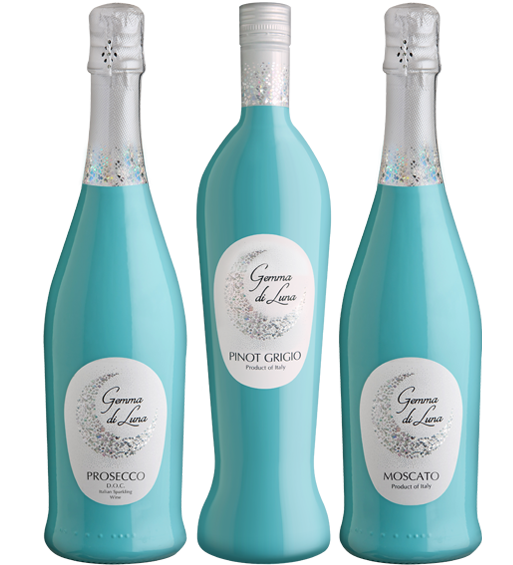 From the graceful teal bottles, stunning laser foil embellished labels, to the exquisite wines inside, Gemma di Luna delivers everything consumers want in wine. Sweet aromas of candied rose petals and peach gummies. A plethora of fresh grapey Moscato character balanced by crisp acidity. Fruity aromas of white peach and mango taffy meet elegantly plush fruit flavors that culminate in a smooth, medium-length sweet yogurt, lime zest and underripe strawberry finish with soft, fruit tannins and no oak. Persistent perlage with a stand out floral bouquet. Nicely savory and complex palate with a mineral finish.